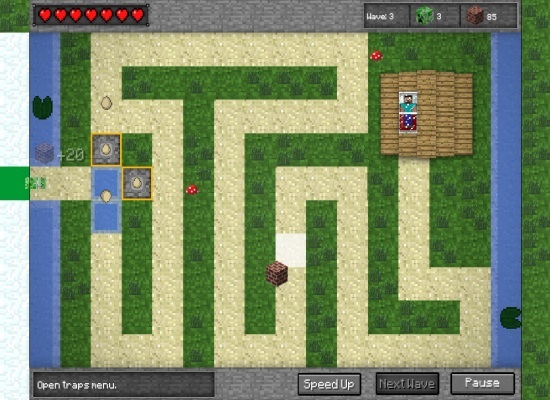 You should participate in the Minecraft Tower Defense battle now to enjoy every piece of exciting moments. During this tense time, you taste many feelings and gain plenty of fighting experiences since you are a leader of this battle. The trap you choose or the tower you select reflects how skilled you are. Keeping you safe and getting over all waves of monsters are two missions in this game. The money you earned to buy or upgrade weapons (e.g. towers, traps) are from the blocks you dig in the beginning and the monsters you knock out. You have 7 hearts to increase the opportunity for staying and fighting in this battle. Hope to receive good news from you soon! Using the mouse is to do all activities in the game.